A female jogger was attacked in broad daylight this afternoon in East Rver Park. 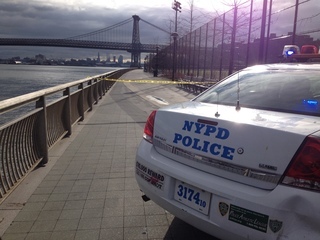 The woman, 41, was running along the FDR Drive near Delancey Street inside the East River Park, just before noon when she was grabbed from behind and thrown to the ground. The attacker attempted to tear off her clothes. The woman screamed police said and the assailant fled. The victim was taken to Beth Israel hospital with cuts and bruises. The attacker is described as a male black, late teens to early 20's wearing a grey sweatshirt and green pants. Police are searching for the man. No arrests have been made.